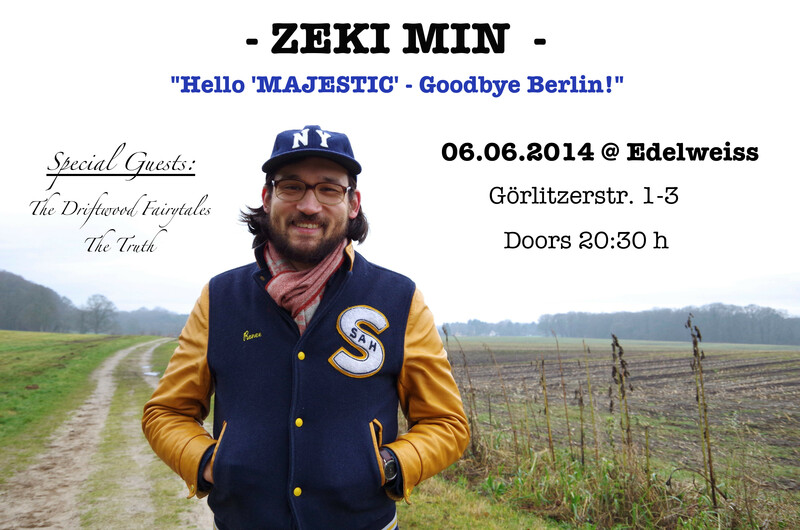 Hello MAJESTIC – Goodbye Berlin!! PLUS I’ll Be On The Radio!! On the 06.06.14 I am playing my record release in Berlin at the Edelweiss in the Görlitzer Park. This is a very special event for me as it’s also my Goodbye Berlin – Show as I am moving to Bremen in Summer. I’ll be playing some songs on my own, some others with Rich and Hadl who recorded ‘MAJESTIC’ with me. Opening that night will be the rock ’n roll monster THE TRUTH. And last but not least, very special guests are Makke and Der Schöne Jan from THE DRIFTWOOD FAIRYTALES who I am playing some good old tunes with. After the concert we’ll be dancing to some of our favorite songs ever!! I am really looking forward to you having a great concert and party with you!!! Another important notice. On the 01.06.14 I am going to present my new album on the radio at Christoph Schrag’s show Unsigned (http://www.fritz.de/programm/unsigned.html). I am totally looking forward to playing some songs and talking about stuff with him! So, if you’re free the next Sunday, tune in! So, that’s it for now. See, or hear you soon! Previous Post PRE-SALE starts NOW!